1. 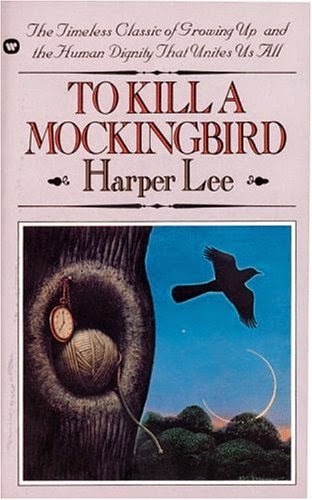 To Kill a Mockingbird by Harper Lee--My pick is TKAM because it is just one of those really great comfort reads for me, and what better time to read it than the summer? Plus I've got the audio narrated by Sissy Spacek, which I can just throw in my car whenever I want. 2. Jane Eyre by Charlotte Bronte--I read this one in seventh grade for the first time, and even though it took me a while, I loved it. I actually read this because I read about the big twist in a different book, and it sounded good. I was right! 4. Anne of Green Gables by L.M. Montgomery--This remains one of my favorite books to this day. I wanted to be friends with Anne when I was growing up, and I would name different parts of my yard like Anne does. Plus, who doesn't love the Gilbert/Anne romance? I remember buying this book at the book fair in third grade and then deciding it looked too long. Then I decided to read the Great Illustrated Classic, and I remember thinking I didn't want Anne's adventures to end. So I dug out the unabridged copy and started over! 5. 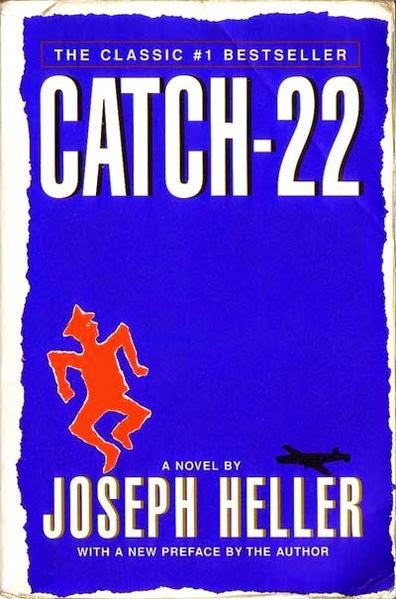 Catch-22 by Joseph Heller--People either love or hate this book. I think a lot of it has to do with whether they are able to follow the various strings of the plot. This novel is full of memorable characters--even the secondary and tertiary characters are supremely entertaining. It truly exhibits the madness of war and of blindly following orders. I laughed and cried and applauded. 6. The Grapes of Wrath by John Steinbeck--This novel hold a special place for me. Steinbeck does a great job of setting the scene in Oklahoma and I think it helps explain why Oklahoma is the way it is--it never recovered from the Depression. That said, the Joads' journey west to California is heartbreakingly entertaining. It's hard to believe that this stuff actually happened, but it definitely did. This one talks about the resilience of people and says a lot about the strength of women within the family. 7. 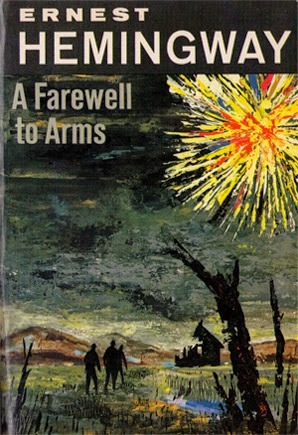 A Farewell to Arms by Ernest Hemingway--This was my first experience with Hemingway. I really enjoy the story of this novel. I haven't done a close reading of it--which means I really need to soon--but I can't help but get caught up in the story. There are moments of action that make you catch your breathe and there a moments of happiness that also make you catch your breath. Definitely need to re-read soon! 8. The Sun Also Rises by Ernest Hemingway--This was the third Hemingway novel that I ever read. I love reading about the 1920s ex-pat scene and this perfectly fit the bill! It made me want to run away from home and travel around Europe. Like The Great Gatsby, this novel also explores the emptiness of life except following ex-pats living in Europe! It has some interesting characters. I like how Hemingway weaves in his own experiences into his novels. They make for a rich reading experience. 9. 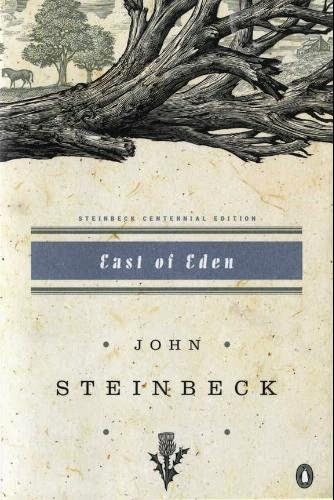 East of Eden by John Steinbeck--I love this book! Steinbeck retells the story of Genesis in this novel and also weaves in his own family's history. He creates an overwhelming sense of place and extremely deep characters that touch your lives and wriggle their way into your mind. Lee is one such character. He's stayed with me for over four years. I am partway through a re-read of this novel and am very much looking forward to picking it up again. 10. 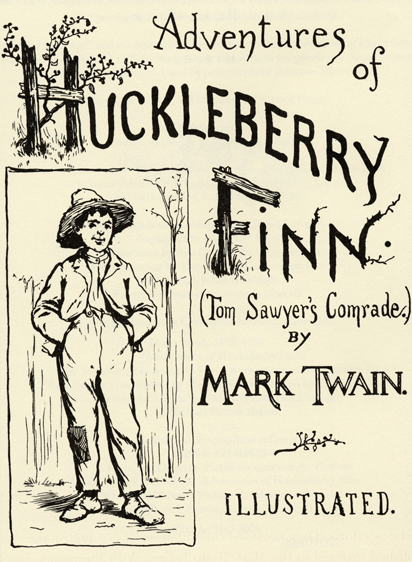 The Adventures of Huckleberry Finn by Mark Twain--I'm honestly kind of surprised that I included this novel. I had a horrible experience in a single-author course as a junior in college and haven't been able to pick up any Twain since. But this novel is a perfect satire! It points out the hypocrisies in human nature. As an outsider living within society, Huck cuts through the bs, which makes him the perfect narrator. It's a truly American story. And I think I can finally read it again. Great list. Anne of Green Gables is definitely one of my favorites. First of all, I totally agree that To Kill a Mockingbird is perfect to read during summer, but second of all - I don't even like audiobooks but I would definitely buy one narrated by Sissy! That's really cool! It's funny that the top two on this list are To Kill a Mockingbird and Jane Eyre when on my list it's Jane Eyre and then To Kill a Mockingbird; they're both such great books! YES to Emma!!! I wanted to put all of Jane Austen's books on my list, but I settled for just one. :) Team Paul Rudd, for sure! I went much older with my definition of classics! The newest book on my list was Montesquieu's The Persian Letters, from the 18th century. My list also included some books from the ancient world, like The Ramayana and The Mahabharata. How did I forget the Brontes. Jane Eyre is one of my favorites! Anne of Green Gables would definitely have made my favorites list, but l listed classics I want to read, instead. Great list! I grew up half-hour south of Hannibal in a little Mississippi River town, so Mark Twain has always been a fave. great choices, I like to read the classics now and again. I especially love the language style in them. fun topic today. Jane Eyre! East of Eden!! Oh gosh, such a great list! While it's said that a classic is a book everyone talks about but which no one has read, many of these are phenomenal reads, great stories. "To Kill a Mockingbird" is especially so..
East of Eden by John Steinbeck and To Kill A Mockingbird by Harper Lee also made my top ten list as well. The Adventures of Huckleberry Finn! I remember loving that one when I was younger...definitely need to reread it. Excellent list! I have some of the same on mine. I can't believe I forgot To Kill a Mockingbird! I've actually never read any Bronte but I definitely want to soon! 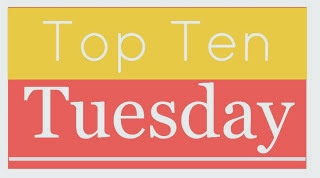 I had a bit of a break last month but I'm back with my favourite Top Ten. Since I love classics, I have really enjoyed this prompt but I've also had a problem restricting the list to only ten. Thanks for the idea. I'm listening to Emma on audible and she's such a relatable character, even when she's unlikable. I really love it so far and I'm glad to hear it's your favorite! Tahleen - if I were to list my top 4 favorite books, your list and mine would match. I know a lot of Austen fans aren't Emma fans, but she is my favorite heroine and Emma is my favorite Austen. Lori - I'm rereading East of Eden this summer and cannot wait to get started! A Farewell to Arms is on my Classics Yet to Read list. I didn't read Huck Finn until just a few years ago, but absolutely loved it. I actually listened to it instead of read it, and found the dialogue much easier to deal with that way. Great lists! I love Emma and the 2009 mini-series! I am so jealous that you had a Jane Austen class! We only had a Charlotte Bronte class and Austen was rarely if ever taught in any of the classes when I was at school. I love To Kill A Mockingbird so much! And Jane Eyre made it to my list of Classics I really want to read! But Anne's adventures don't end with Anne of Green Gables - there are eight books in the series (and I devoured them all in middle school).